ASAP Checks offers a complete range of high-quality laser checks, suitable for most accounting software (Intuit Quickbooks, MYOB, Peachtree, and Microsoft Dynamics) and personal finance software (Intuit Quicken). We use premium paper for our laser checks to guarantee they won't jam in your printer. And for maximum convenience, we offer laser check printing with most orders ready to ship in just one day! The full list of security features can be viewed here. When you order laser checks from ASAP, you can be sure they're compatible with all laser printers and ink/inkjet printers. They're also guaranteed compatible with the checks you get from your bank, software vendor, or check printer (such as Intuit, Deluxe, Harland Clarke and Microsoft). If you find this isn't the case, you'll receive a 100% refund. You can sign in here to place an order from the same bank account as your previous order. ASAP Checks proudly provides check printing for individuals and businesses. We offer a plethora of design options for personalizing laser checks ordered online from us. Check out some of the most frequently asked questions about our laser checks. What are laser business checks? Laser business checks are computer printed checks that provide valuable security features as well as record keeping advantages. By utilizing laser checks with your business’s recordkeeping computer software – like QuickBooks and Microsoft Accounting – you are establishing and maintaining accurate records of all financial transactions of the business. You are then able to easily and quickly track and search various expenditures your business incurs. At ASAP we use premium paper for all of our laser checks to prevent printer jamming. In addition, our laser checks include a number of security features to keep your financial information safe and secure from hacking and theft attempts. In fact, ASAP Checks leads the industry in security features and is the only check supplier that uses Toner Grip and Touch Guard (see below for details). Touch Guard: A thermochromic – color changing – ink fingerprint symbol on the back of each check that disappears with heat and returns when it cools. Toner Grip: This coating fuses the toner to the paper preventing criminals from removing the ink and altering the check in some way. Tracing Code: Each batch of check paper has its own unique code that is printed on each page to allow law enforcement to track fraudulent purchases. Black Light Fibers: These invisible threads glow under black light and cannot be reproduced by scam artists. Chemical Wash: This causes black or brown stains to appear wherever chemicals are used to alter the document. Watermark: A true watermark – like that used by ASAP Checks – becomes apparent immediately when the paper is held up to a light and cannot be reproduced. CPSA Padlock: This symbol indicates that ASAP Checks is licensed by the Check Payment Systems Association (CPSA) which confirms the inclusion of their recommended security features. Micro Printing: This text appears to be a line to the naked eye but is actually miniscule text that printers, scanners, and copiers cannot reproduce. Void Text: This text is included on vouchers and the back of stubs to prevent its use in the production of counterfeit checks. Partial Security Feature List: Printed on the back of ASAP checks, this list informs recipients and tellers which security features are present so that they can use them to authenticate the check. This list is “partial” due to the fact that hidden or covert features are not listed. Pantograph: This feature causes scanners and photocopiers to display the word VOID in large block letters when criminals attempt to copy or scan them. How do I print laser checks with QuickBooks? You can laser print checks from your local computer or directly from QuickBooks Online. ASAP Checks offers all three types of laser checks available for use with QuickBooks: Three per page wallet checks, three per page standard business checks, and voucher checks. For fully detailed instructions on how to print laser checks using QuickBooks software, visit the QuickBooks website. Where can I buy business laser checks? Business laser checks are available from a number of providers but not all are created equal. Those that you can order from ASAP Checks are guaranteed to be compatible with all sheet feed inkjet and laser printers that accept standard sized paper (8.5 x 11”). In addition, the guarantee extends to compatibility with checks that may be purchased through another check printer, software vendor, or bank. In the unlikely event that your checks are somehow not compatible, ASAP Checks provides 100 percent of your money back. Thus, there is no reason not to try ASAP Checks for your business laser check needs. Ordering laser printer checks through ASAP’s online portal is less expensive and more convenient than going through your bank. We print in-house to save on expenses and pass those savings on to our customers. Moreover, our quick and simple online ordering process means that your valuable time can be spent focusing on growing your business rather than mundane office tasks. How do I use laser printing checks with Microsoft? Microsoft offers several different software options that provide users with the ability to print checks. 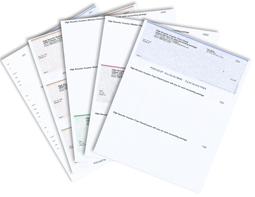 The Microsoft Office feature Microsoft Accounting provides users with the ability to write and print checks directly. This records the transaction the instant you write the check thus, helping to keep your books up to date. If your business uses Microsoft Office it makes sense to integrate this feature into your company’s accounting structure. It is always a pleasure to get checks from ASAP. It is quick and easy ordering and swift delivery. Thanks.. Very good experience. Love to keep using your service.